Have you ever been to Montreal? It’s such a beautiful city. Quite a few years ago I went to a conference there for work. I have to admit; I ditched one of my classes about a quarter way into the lecture after my head was bobbing up and down and I could barely stand myself. I headed out into the street and started zipping into as many shops as I could before I had to be back for my next lecture. One of the things I noticed rather quickly was there are a lot of shops displaying maple syrup. Canadians are really proud of their maple syrup and they should be. It’s top quality. They like to use their maple syrup in a lot of things; not just over pancakes. I came across a store that had maple syrup tastings. What, stop, whoa…maple syrup tastings? that’s right. There is light, darker, darkest; whatever you like. I learned a lot that day about maple syrup. I learned you should never settle for anything but the real thing. 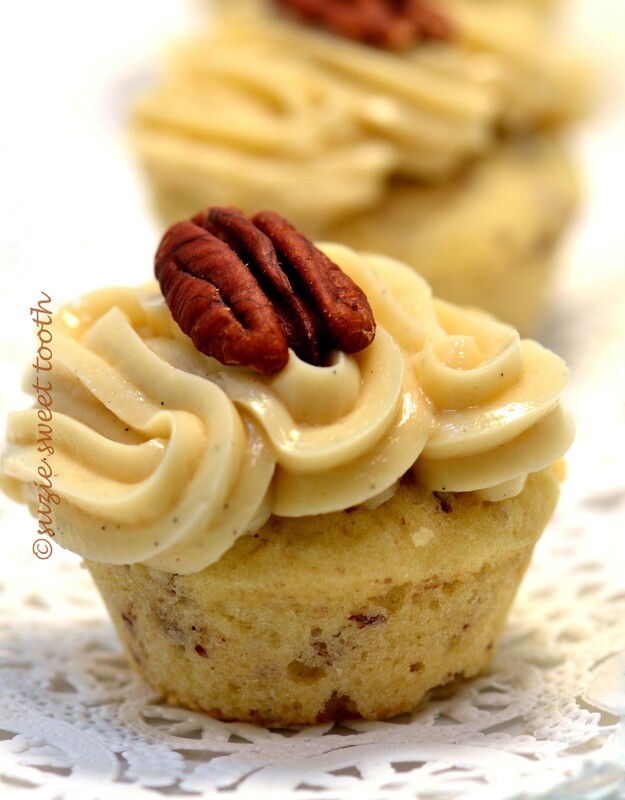 These cute little mini cupcakes are topped with maple buttercream. Make sure to use the best you can find. 1. Preheat the oven to 350 degrees F. Place a 24 well silicone mini muffin cup liner on a baking sheet. Conversely if you don’t have a silicone muffin pan you can use regular mini muffin pan with paper liners. 2. Cream the butter and sugar until fluffy. Add the eggs and beat until smooth. Add the milk, vanilla and stir. Combine the rest of the dry ingredients and whisk to combine. Add the flour mixture and beat to combine. Stir in the chopped pecans. 3. Fill the wells of the mini muffin cups with one Tablespoon of batter. Bake for about 11-12 minutes or until a wooden skewer comes out clean. Let the cupcakes cool for about 2 minutes and then remove to a wire rack to continue cooling until completely cool. 4. 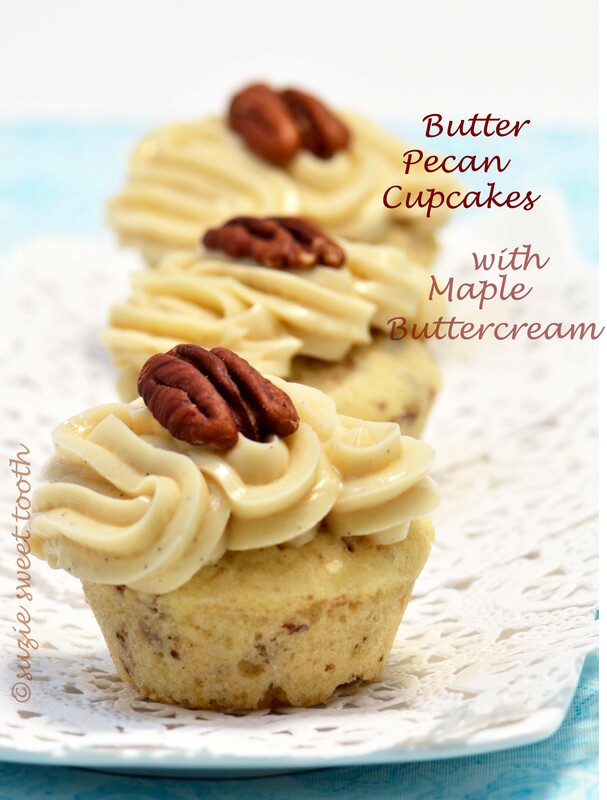 Frost cupcakes [use a start tip if you have one] with Maple butter once cakes are completely cool and top with a whole toasted pecan. Cream together the butter and sugar until light. Add in the salt and vanilla and beat until smooth. Add the maple syrup, beat until smooth. Add any additional confectioners sugar if needed one Tbsp. at a time if buttercream is too soft.